Arri “Harry” Bertoia (American, born Italian, 1915-1978). Teapot, ca. 1942. Sterling silver, ebony, brass. 7.68 x 8.25 x 4.13”. 2012.118 Photo: David H. Ramsey. What comes to mind when you hear the name Harry Bertoia? [ii] Most people probably think of his wire chair designs for Knoll Associates. Or perhaps one remembers his large-scale architectural sculptures that explore concepts such as light, space, sound, and movement. It is doubtful, however, that the magnitude and diversity of Bertoia’s artistic repertoire is fully considered. He was an extremely gifted designer, artist, and craftsman who dedicated much of his life to investigating techniques and processes associated with metal. Bertoia’s first encounters with metalwork occurred at Cass Technical High School in Detroit, Michigan. Primarily he experimented with jewelry utilizing silver, copper, ebony and stone. At Cranbrook Academy of Art, these investigations continued. In 1937 Bertoia was accepted on scholarship at the school after he submitted a portfolio and “a small box of jewelry.”[iii] Located in Bloomfield Hills, Michigan, Cranbrook encouraged creative freedom and attracted some of the most influential artists and designers of the twentieth century. [iv] Bertoia thrived in this environment. In retrospect, he acknowledged that “…it was one of the basic periods of [his] life where things began to change and happen.”[v] In 1939 Eliel Saarinen, Cranbrook’s president, asked Bertoia to reopen the metals shop. [vi] This appealed to him and soon Bertoia had a full-time teaching position while he continued his studies. Bertoia ran the metals area until 1943 when World War II made metal too scarce. 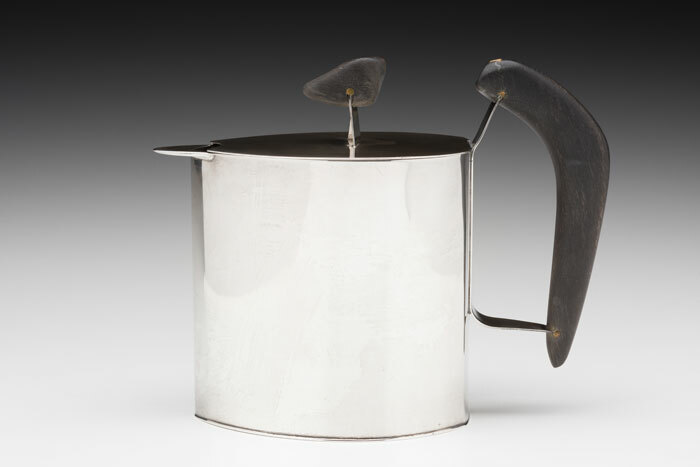 Within the Kamm Collection, there is an excellent example of a Bertoia teapot. It is a simple tear-dropped shaped form with a flat bottom and top. A knob-like ebony finial extends upward from the lid and an ebony handle, attached with silver straps and brass rivets, curves outward from the structure’s body. Although this teapot does not have the insulating double walls mentioned previously, it does contain a frequently utilized Bertoia feature, a small rounded spout with a triangular insert. This created a seamless flow when pouring liquids. Upon leaving Cranbrook, Bertoia accepted positions designing furniture first for Charles and Ray Eames (Evans Products Company) and later for Hans and Florence Knoll (Knoll International). The Eames and Florence Knoll were students and friends from Cranbrook. For Eames, Bertoia was a valuable member of the team that developed the celebrated molded plywood chair. [xiii] He worked for Evans Products Company from 1943 until 1946. During this period Bertoia also continued to create jewelry, monotypes, and sculpture. However, his hollowware work ceased. At Knoll Bertoia produced a collection of chairs including his sculptural, steel, wire-mesh Diamond Chair. This fruitful relationship, which lasted until 1953, provided Bertoia with an immense amount of creative freedom. Today Bertoia is referred to as an “ultimate mid-century Renaissance man.”[xv] As you study his career certainly the volume and array of his creative endeavors is impressive. This was truly a man who processed immense talent. However, this teapot in the Kamm Collection reminds us of the importance of those early years at Cranbrook Academy of Art. Bertoia’s initial experiences in the metals shop sparked a lifelong interest in metal that had a profound impact. Bertoia, Celia. The Life and Work of Harry Bertoia, The Man, The Artist, The Visionary. Atglen, PA: Schiffer Publishing, Ltd, 2015. Cranbrook Art Museum, Bent, Cast & Forged: The Jewelry of Harry Bertoia. Fehrman, Cherie and Kenneth. Postwar Interior Design: 1945-1960. New York: Van Nostrand Reinhold Company, 1987. Greenbaum, Toni. Messengers of Modernism American Studio Jewelry 1940-1960. Paris: Montreal Museum of Decorative Arts, 1996. Nelson, June Kompass. Harry Bertoia Sculptor. Detroit, Michigan: Wayne State University Press, 1970. Oral history interview with Harry Bertoia, 1972 June 20. Archives of American Art, Smithsonian Institution. Schiffer, Nancy N. and Val O. Bertoia. The World of Bertoia. Atglen, PA: Schiffer Publishing Ltd, 2003. Selim, Shelley and Celia Bertoia. Bent, Cast & Forged: The Jewelry of Harry Bertoia. Bloomfield, Hills, Michigan: Cranbrook Art Museum, 2015. [i] Celia Bertoia. The Life and Work of Harry Bertoia, The Man, The Artist, The Visionary (Atglen, PA: Schiffer Publishing, Ltd, 2015), 26. This is an excerpt from Bertoia’s Cranbrook Academy of Art application. [ii]Bertoia was born Arri and had the nickname Arieto. When he came to the United States with his father in 1930, his name was changed to Harry. 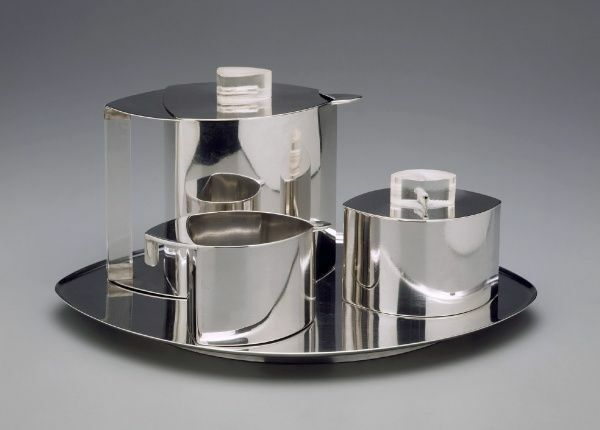 [iv] While Bertoia was at Cranbrook many notable artists and designers were there as well including Carl Milles (sculpture), Maija Grotell (ceramics), Eliel and Eero Saarinen (architecture), Florence Schust Knoll (furniture), and Charles and Ray Kaiser Eames. (furniture). Bertoia also met his wife, Brigitta Valentiner, at Cranbrook. [vi] The metals shop closed in 1934 due to metal shortages during the Depression. English metalsmith Arthur Neville Kirk was the last person to run the shop. Eliel Saarinen was a well-known Finnish architect who came to the United States in 1923. Saarinen was president of Cranbrook from 1932-1948. [vii] At Cranbrook Bertoia also produced drawings and numerous monoprints. [viii] Bertoia’s jewelry was shown at the Museum of Modern Art in the 1946 exhibition called Modern Handmade Jewelry. This important show also included the works of Alexander Calder and Sam Kramer. [xii] Lucite is a transparent or translucent plastic. [xiii]Bertoia and the other designers involved in the development of the molded plywood chair received no recognition for their contributions. Bertoia developed the wire frame, rubber mounts, and was responsible for the decision to separate the back portion from the seat creating two separate sections. This lack of credit became a point of frustration when in 1946 the molded plywood chair was shown in an exhibition at Museum of Modern Art and Charles Eames was the only person given credit. From my research the design Bertoia worked on had three metal legs. [xiv] Oral history interview with Harry Bertoia, 1972 June 20. Archives of American Art, Smithsonian Institution. [xv] Dominic Bradbury. Mid-Century Modern Complete. (New York: Abrams, 2014), 31.